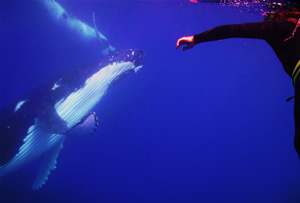 The video shows the whales cavorting with free-diver John Tresemer, one whale posing belly-up for photographer Mila, and finally another whale pirouetting for videographer Barrel and then extending its pectoral fin, trying to make contact with him. Mila originally offered the video to major news media, which expressed no interest. Mila said, "The media seems more interested in showing sea creatures making violent blood-and-guts attacks on people, rather than a friendly encounter by an intelligent species attempting human contact. My motive in publicizing this event is to raise public awareness about Japan's continued illegal whaling in protected whale sanctuaries, and world-wide whaling by several other nations. Since the major networks were disinterested in the video, YouTube seemed the most logical venue to reach the public." Mila noted that Japanese whalers have targeted this population of South Pacific humpbacks, in addition to minke whales and internationally protected rare fin whales. He praised the efforts of the anti-whaling Sea Shepherd Conservation Society, headed by Captain Paul Watson, for saving whales from slaughter by confronting the Japanese whaling fleet in the Southern Ocean whale sanctuary. 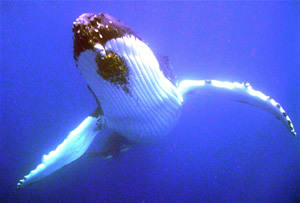 Mila has experienced numerous encounters with friendly humpback whales in the Silver Bank, near the Dominican Republic, which inspired him to publish his anti-whaling novel, Whales' Angels (AuthorHouse, May 2006), a mystery/adventure thriller about whaling activists battling pirate whalers and international conspirators attempting to overthrow the International Whaling Commission's ban on commercial whaling. Reviews for Whales' Angels, and further information about the book, are available at www.milabooks.com. PAUL, MY GRATITUDE AND CONGRATULATIONS TO YOU AND ROB IN ALLOWING US TO SHARE SUCH SPECTACULAR VIEWS OF THESE HUMPBACK WHALES. THE ARTICLE IS INSPIRING AND INFORMATIVE. I STRONGLY RECOMMEND READING PAUL MILA'S THREE NOVELS WHICH I FOUND VERY ENTERTAINING AND HARD TO PUT DOWN!LOOKING FORWARD TO YOUR NEXT ADVENTURES IN WRITING AND FILM!